This is a traditional bread eaten at Christmas and right up to New Year. The name Christopsomo means Christ's Bread. We hope you all have a wonderful Christmas and peace and happiness in 2012! 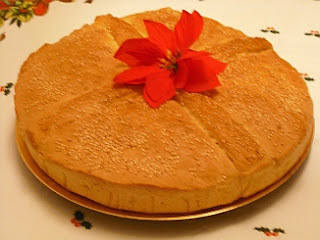 Don't forget to check out our other recipes for Greek Christmas sweets - Melomakarona and Kourabiedes. Dissolve the yeast in the lukewarm water. Melt the butter and add the milk to it and then add the salt, sugar, anise and mastic powder. Put the flour in a large mixing bowl, shaping a hole in the middle, where you put the dissolved yeast and mix it into the flour with a wooden spoon. Cover the bowl with a damp cloth and leave in a warm place for 15 minutes. Remove the cloth and add the butter mixture, mixing it in. Add enough tepid water to make a pliable but firm dough and knead the mixture very well for at least 10 minutes. Cover the bowl and leave it in a warm place for about 1 hour. Use a round oven dish 30cm in diameter and 4-5cm high, with greaseproof paper on the bottom. Place the dough in the oven dish, so that it fills it and is flat on top. Add the 2 narrow strips like a cross on top, with their ends going down under the dough in order not to become ‘unstuck’. Leave in a warm place, covered, for about 1 hour, until it rises to about twice its size. Put the egg white in a small bowl and beat with about 1 tbsp water. Brush the top of the dough evenly with this egg white mixture. Sprinkle the sesame seeds evenly on top. Bake in a preheated oven at 220 degrees Celsius for about 1 hour, until it’s golden brown. What do you top it with, or serve it with, at home? Do you eat it hot or cold usually?